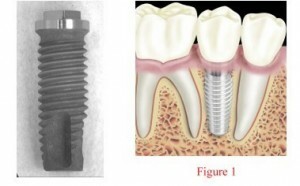 These implants are similar in structure to natural, single-rooted teeth and are the most widely used. The selections we use depend upon the patients needs. Mini dental implants are smaller in diameter than root form implants. We use them to temporarily or permanently stabilize a lower denture. Mini dental implants can be used permanently if a patient has minimal bone density or can’t withstand traditional implant surgery. 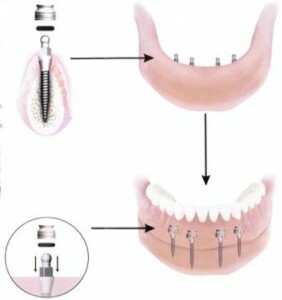 Mini implants can be placed and restored in a single visit. Click here to learn more about mini dental implants. 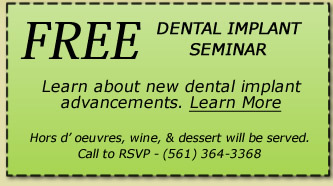 To schedule your complimentary dental implant consultation, call our office at 561-364-3368. Dr. Edward P. Broggi provides state-of-the-art dental implants for residents of Boynton Beach, Delray Beach, Lake Worth and surrounding areas. For general, cosmetic and sedation dentistry in Boynton Beach and surrounding areas, visit our dentistry site.